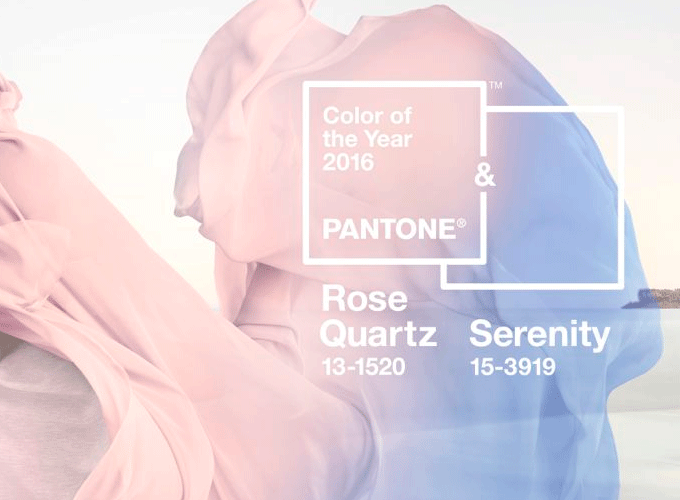 For the first time ever, Pantone has awarded the title of “Color of the Year” to two colors, Rose Quartz and Serenity. The blending of these two colors creates a perfect harmony by balancing the warmer hues of Rose Quartz with the cool, tranquility of Serenity. Still terrified to go use pastels on your restaurant furniture? You’re not alone. Using the Pantone Color of the Year on big investment pieces like restaurant furniture is intimidating and risky. Admittedly, it can go either one of two ways: 1. it could end up looking like you’ve just designed the world’s most extravagant gender reveal party or 2. it can look boring and dated within months of your client’s grand opening. But, once you find the perfect balance of color, texture, and lighting, the rest is pretty easy. Embrace your passion for pastels by choosing the chalkier, muted shades of these blues and pinks. Start with a chair with a simple silhouette, like Brady or Hugh, which looks perfect in a space with tons of natural light, lots of white space, and rustic accents like brass fixtures and oiled wood table tops. The goal here is to balance color with natural materials to maintain the peaceful ambiance traditionally associated with these colors. Still don’t believe that it is possible to successfully saturate a restaurant interior with these colors without it feeling like the set of Miami Vice (but even if it does, we wouldn’t be mad)? 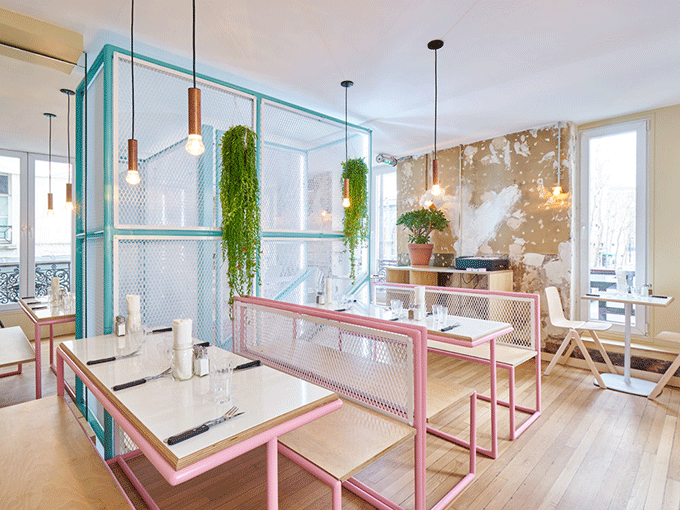 PNY, a fearless burger restaurant located in the heart of Paris, takes an unapologetic approach to commercial interior design. Designed by CUT Architectures, this restaurant simultaneously feels modern and nostalgic, making it one of our favorite new restaurant interiors of 2015. While these hues veer more toward the brighter, flamboyant side of the spectrum, it’s the perfect mashup of unique and simplistic elements. This space incorporates plenty of natural elements like the light wood floors, chairs, and table edges (which we adore) to tone down the overwhelming splash of color. 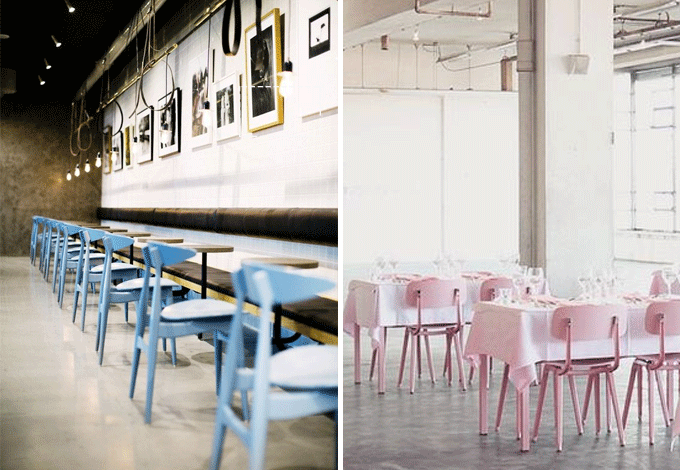 Convincing your client to go pink or blue with their restaurant furniture can be hard, and we don’t blame them, it’s a sizeable investment. Another way to approach it would be to add a pop of color using upholstery. Not only is it easy and fairly inexpensive to replace, but it adds a tactile element that metal and wood just lacks that screams comfort. 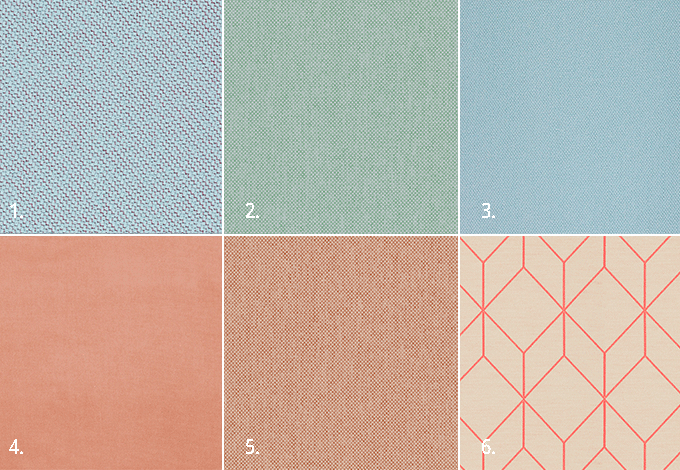 To save you from having to search through hundreds of pages on fabric websites, or sift through thousands of swatches, we’ve gathered up our favorite commercial textiles that feature this year’s Pantone Color of the Year that would look great on restaurant furniture in any coffee shop, lounge, or bar. 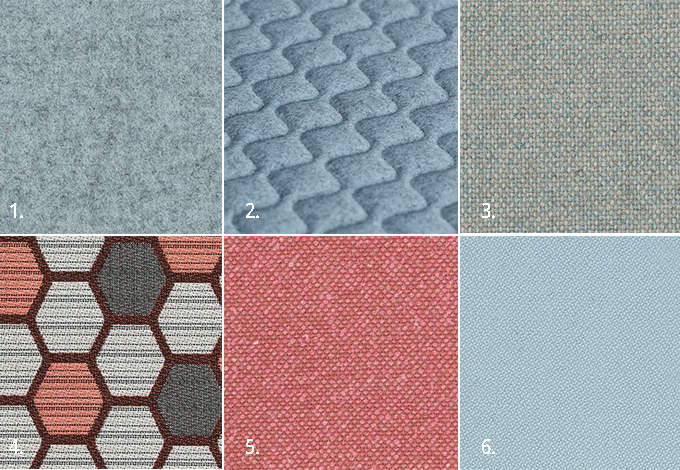 Camira and Maharam have done an excellent job of offering up affordable pastel solutions in a variety of textures, patterns, and hues. 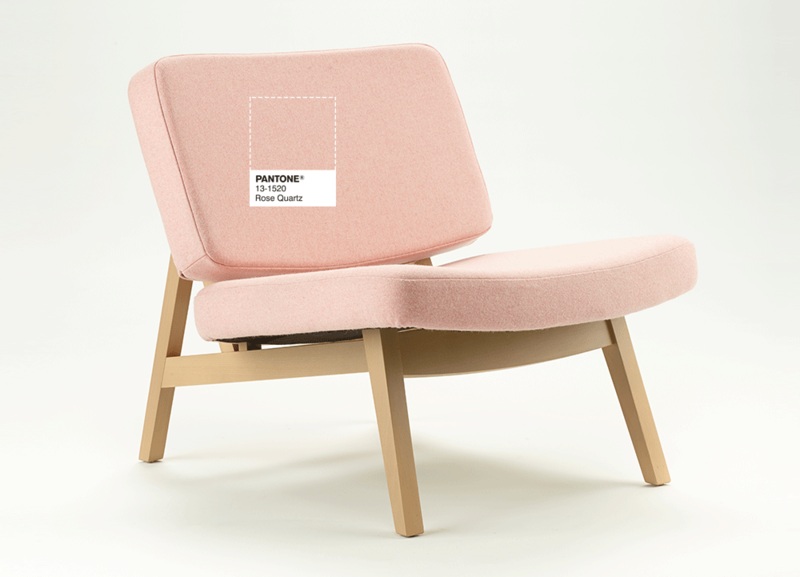 Ready to go bold with Rose Quartz and Serenity, check out our Leo Chair, or, if you’re going for a more traditional approach look at Hugh. Like most good things in life, no risk, no reward. These colors are unique but they have the ability to make an extremely memorable interior that could surprise and delight your customers.